Recently, Drexel University professor Dr. Andrew Zitcer and I embarked on a research project to uncover the largely unknown history of the Philadelphia Area Cooperative Federation, an association of 18 consumer food co-ops, many of them black-owned, which was active from roughly 1943 to 1952. It’s a fascinating history that still matters today. In honor of Black History Month, here’s a piece of what I’ve learned. The Federation had extensive educational programs, including study clubs that were meant to prepare groups of neighbors to open their own food cooperatives. Under the leadership of Federation staff member Samuel Evans, these programs spanned many neighborhoods in and around the city and included both blacks and whites. A July 1947 article in The Philadelphia Inquirer titled “Negroes [sic] in Area Plan 3 More Cooperatives” documents the accomplishments and plans for cooperative development in black communities in the region. At the time, there were 50 study clubs comprised of only black members as well as 20 racially-mixed study clubs. As the title suggests, plans were underway to open food cooperatives in North (at 1126 W. Jefferson St.), South, (“somewhere near 18th and Christian Sts.”), and West Philadelphia (“‘half a dozen good spots’ under consideration”). Language like “cooperation as against the use of force” might make you wonder how the cooperative movement and the civil rights movement intersected. Luckily, last year, Dr. Jessica Gordon Nembhard published a landmark book detailing the history of black cooperatives and situating them in the larger historical context. 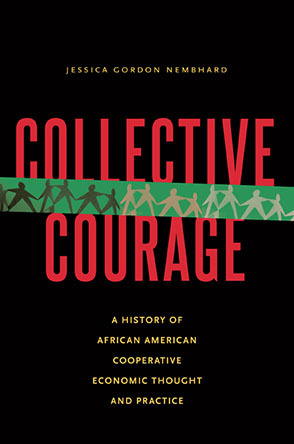 The book, Collective Courage: A History of African American Cooperative Economic Thought and Practice, is the only attempt to compile a chronicle of this important history in the last hundred years or so. You might be surprised by how many big names in the civil rights movement participated in and even spearheaded co-op organizing initiatives. “Many of the players are well known in the history of the African American experience: Du Bois, A. Philip Randolph and the Ladies’ Auxiliary to the Brotherhood of Sleeping Car Porters, Nannie Helen Burroughs, Fannie Lou Hamer, Ella Jo Baker, George Schuyler and the Young Negroes’ Co-operative League, the Nation of Islam, and the Black Panther Party,” the book’s synopsis reads. Collective Courage is tremendously inspiring and frequently heartbreaking. Dr. Gordon Nembhard found evidence of many ambitious cooperative enterprise projects in black communities. These cooperatives were too often short-lived—usually because they were terrorized, sabotaged, or destroyed by racist people and institutions. The modern-day Philadelphia Area Cooperative Alliance (PACA), inspired by the 1940s study clubs, is hosting a discussion on Collective Courage and the history of black co-ops on Thursday, March 19 at W/N W/N Coffee Bar. PACA has compiled articles, videos, and supplemental reading is also available on the GEO website if you can’t get your hands on the book. Caitlin Quigley is a proud co-op fanatic. She helped launch the Philadelphia Area Cooperative Alliance and is a member-owner of Mariposa Food Co-op, The Energy Co-op, and Philadelphia Federal Credit Union. In her work, Caitlin has focused on organizing to strengthen local economies and fundraising for social justice movements. Caitlin lives in West Philly and is a dedicated but slow-moving bike commuter. You can follow Caitlin on Twitter at @cequigley.